Ray Handal. Photo by Teresa Genaro. Handal claimed Winter Springs, a French-bred four-year-old gelding, off a fourth-place finish on opening week at the Spa. Winter Springs is owned by Zilla Racing Stables, a client that Handal met through a former employer, Tom Morley, for whom he worked for about 10 months. Growing up in Jamaica, Handal was introduced to horse racing by his father, who was visually impaired and who relied on his son to help him handicap. Habitués of Jamaica’s Caymanas Park, the duo switched to the south Florida tracks when the family moved to the United States. Before long, still a teenager, Handal took off for the racetrack, with his parents’ blessing. He got his first job as a hotwalker at Colonial Downs in Virginia, where he met Jonathan Sheppard. The Hall of Fame trainer brought Handal to his Pennsylvania farm, and Handal learned to ride there under Sheppard’s tutelage. From there he worked with Michael Matz at Fair Hill, then headed west to Kentucky to the barn of Ken McPeek, where he stayed for four years before employment stints with Christophe Clement and Anthony Dutrow. Based in New York while working for Dutrow, he elected to stay there to open his own stable in 2014. He has half a dozen horses now and employs three people, a ratio that he admits isn’t ideal but that he maintains so that he can support sending horses early when they run out of town. He looks for consistency, he said, when he claims horses, and he liked that Winter Springs was regularly running speed figures in the mid-80s. He put the horse in draw reins because he observed him carrying his head a little high, an adjustment that resulted, he said, in a horse that seemed happy and a little perkier. “He put on a little more muscle mass, somewhere between 50 and 75 pounds,” he said. “And he dappled out well. I also thought maybe blinkers might help him. 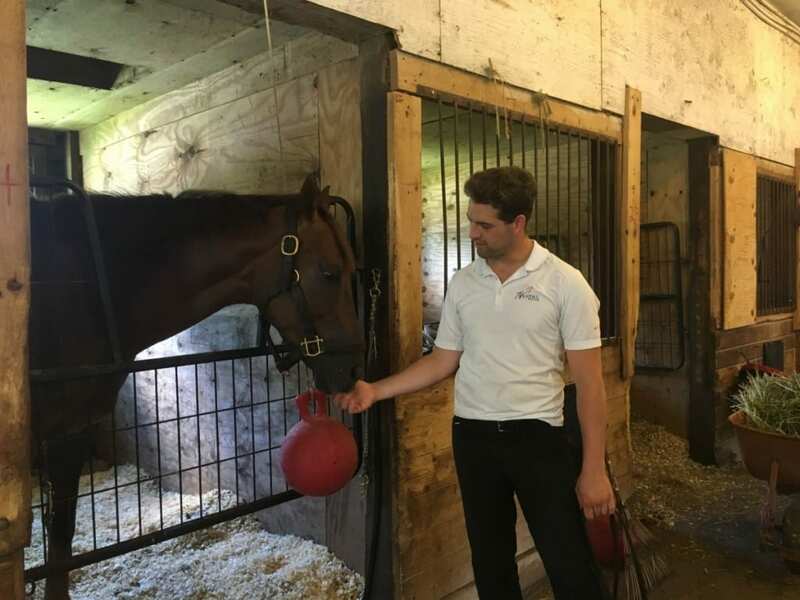 Handal still talks to his father every day, getting advice from someone outside the world of the backstretch, from the man without whom Handal might not have made his way into his current career. And, maybe, to remind himself of the little boy who used to go to the track with his father, looking awestruck as people like Mike Smith and Jerry Bailey.